I had tons of tomatoes all summer. I even managed to save tons more from frost by bringing them inside to finish ripening. But I also had tons of unripe ones that stayed green. I couldn’t just throw them away and I don’t like “fried green tomatoes”. 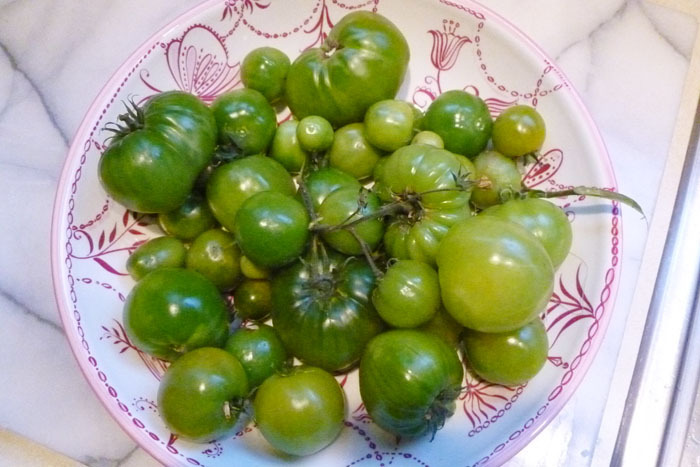 So I looked around online and found this fab recipe for green tomato salsa. I adapted it to use ingredients I had on hand and it was delicious! 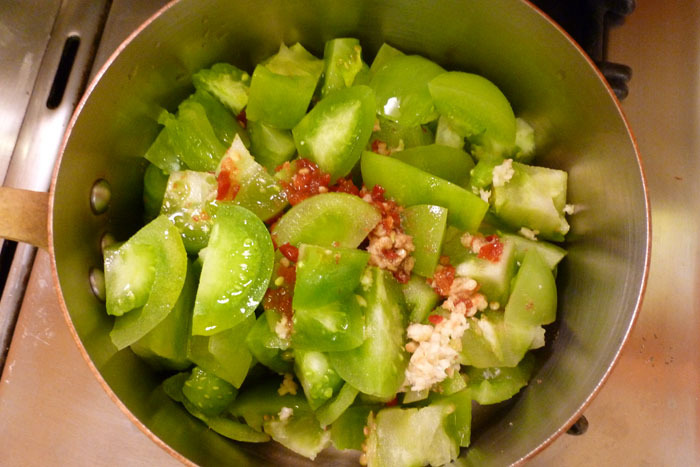 Combine the green tomatoes, onion, chili paste, garlic, salt, cumin, olive oil, and water in a medium pot. Bring to a boil and then turn the heat down and cook covered on a medium-low twenty minutes, stirring occasionally. Stir in and simmer for five or ten minutes the lemon juice, sugar, and cilantro. Season to taste. Let it cool off a little then puree it in a food processor to the consistency you like. You’ll need to let it cool all the way down before you eat it, it’s not that great warm. We had it with fresh tortilla chips. Then later in the week I added ithe rest of it to some tortilla soup for some extra kick. 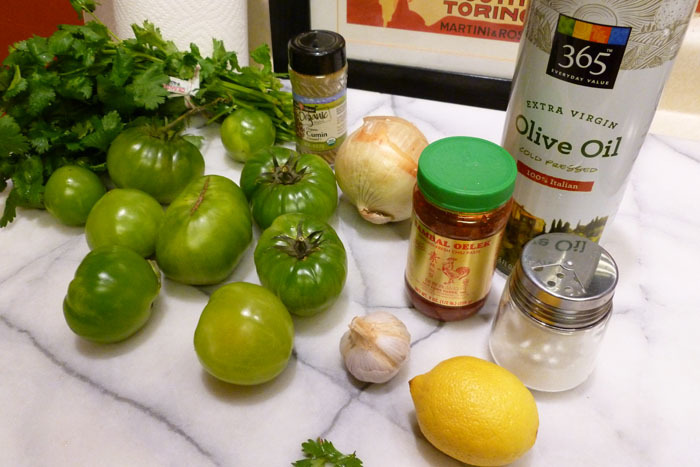 I don’t have any more green tomatoes, but if I did, I’d for sure make more of this salsa. 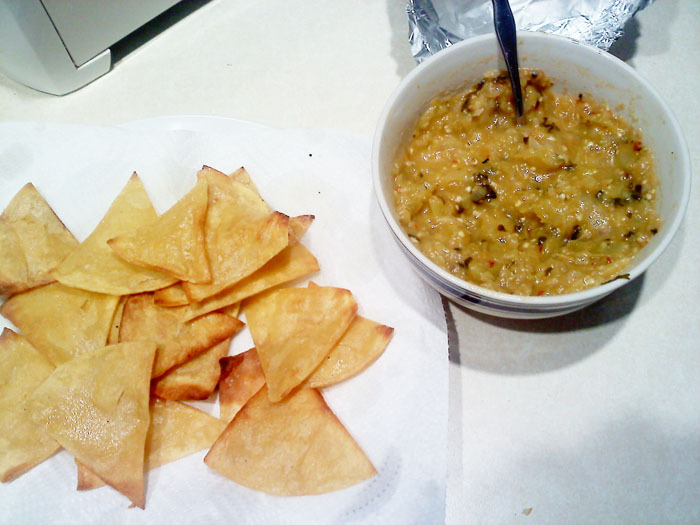 Green Tomato Salsa and fresh tortilla chips. Yum!